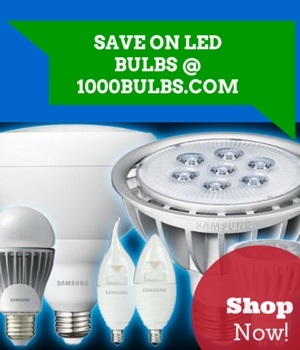 Visit 1000Bulbs.com for your lighting needs! For the seventh consecutive year, internet lighting retailer 1000Bulbs.com has been honored by the Dallas 100™ Awards, placing 44th amongst 100 of the fastest-growing privately held companies in the Dallas area for the year 2013. Co-founded in 1990 by the SMU Cox School of Business and the Caruth Institute for Entrepreneurship, the Dallas 100 Awards are now in their twenty-third year of recognizing the growth of independent companies and the entrepreneurs behind them. Have a credit report and character satisfactory to the Dallas 100, determined at the sole discretion of the Dallas 100. Founded in 1995 as Service Lighting and Electrical Supplies by CEO Kim Pedersen, 1000Bulbs.com now has one of the largest selections of lighting products in the country. Having recently expanded to include home décor lighting, designer furniture, antique model replicas, automotive lighting, and hydroponic supplies, 1000Bulbs.com now has over 30,000 products on its website. "We’ve come a long ways, but have much further to go," says Pedersen. "We’re consistently striving for the best experience for our customers and not resting on just being a good retailer." Since first being recognized by the Dallas 100 Awards in 2007, 1000Bulbs.com has increased its annual sales by 83 percent, continuing to establish itself as an influential force in the retail lighting industry. Now employing over 200 workers, 1000Bulbs.com occupies more than 220,000 square feet of office and warehouse space in Garland, Texas. 1000Bulbs offers everything from simple, household light bulbs to cutting-edge specialty lighting systems. Nationally recognized for growth, innovation, and customer satisfaction, 1000Bulbs.com is an influential force in the lighting industry. Follow @1000Bulbs on Twitter for the latest company announcements.